Taylor McCoy, founder of the website Everything Dinosaurs, shares his extensive knowledge on starting and having a fossil collection. Taylor has previously been a guest on the podcast (Juratyrant – Episode 8), as well as a guest writer. 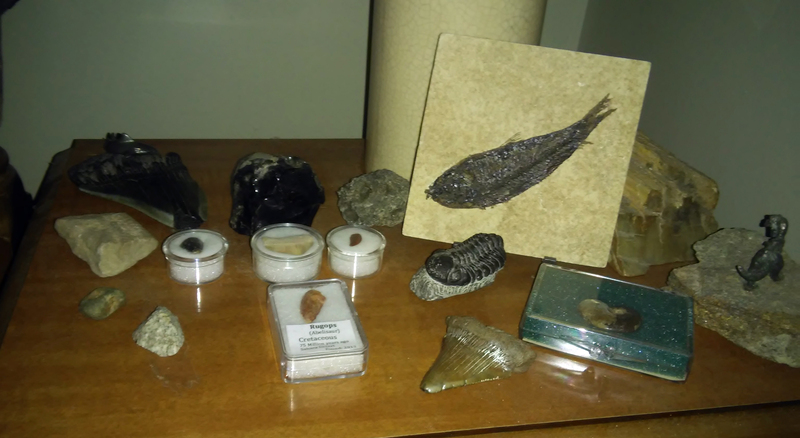 And he has an impressive, extensive fossil collection consisting of over 60 items, which he is continually adding to (in his last post he had closer to 40). Hi, my name’s Taylor McCoy. I’m a big dinosaur enthusiast and the founder of the Weebly site Everything Dinosaurs. 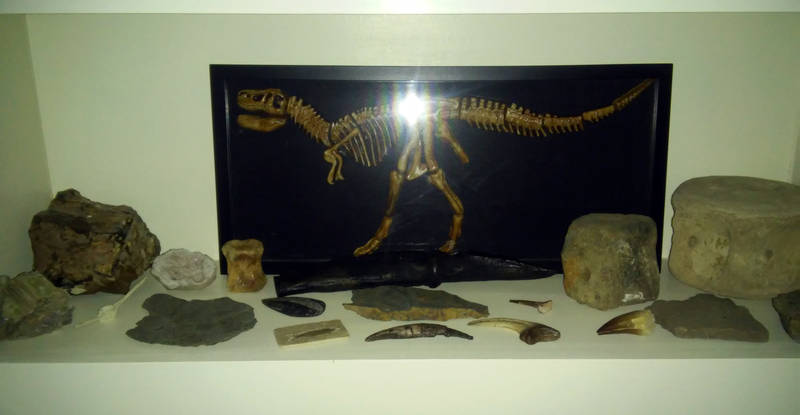 I’ve had the great opportunity of being featured on I Know Dino before and now I’m back with some tips on how you can start your own fossil collection. There are a number of ways you can get fossils for your collection. I’ll go through all the methods I’ve used and also how to display your pieces. One method you can try is literally going fossil hunting. A number of areas have spots devoted to public fossil collecting. A quick Google search could really be useful. For example, the Montour Fossil Pit in Pennsylvania isn’t far from me, so I made sure to take a trip there. I was only there for a few hours, but managed to find over a dozen fossils of prehistoric clams, crinoids, and possible corals. I even found a geode as well. When looking into places like this, it’s important to do some reading on the place. Try to find out as much as you can. If possible, it wouldn’t hurt to try and contact the location if you have any questions. Most public fossil locations aren’t super remote, so you don’t need a ton of supplies. A good rock hammer, fossil identification guide/book, something to carry your finds in safely, and a bottle of water depending on the weather is really all you need. Just remember not to clear out a site so that others may come along and make their own discoveries. Another way to collect fossils is by purchasing them. There are two main ways you can do this, online or in person. When purchasing fossils online, it’s important to buy them from a reputable dealer. A certificate of authenticity isn’t a requirement, but certainly wouldn’t be a bad thing. I will include a few links to sites I’ve used before and trust. Ebay is also an option, though I’d advise you to be careful. If this is the route you choose to take, make sure the seller has a good reputation and good reviews. Purchasing fossils in person(at a store or museum for example) is less risky, but might be harder to do simply because there aren’t a ton of locations. Some areas like Utah and Colorado have many stores that sell fossils due to their high concentrations in those areas. Like many websites, make sure the store is one with a good reputation. Museums are a safe bet and many museum gift shops feature fossils. I’ve used both stores and museums and have always left satisfied. An alternative to actual fossils is fossil replicas. Good quality replicas are cheaper, more readily available, and less fragile than real fossils. Replicas are a good alternative to dinosaur fossils since good dinosaur fossils are so rare. I myself have many fossil replicas in my collection. These can also be purchased online and often in museums as well. Below I will include a link to a site I highly recommend for good fossil replicas. Now that you have a collection, how do you want to store/display your pieces? I suggest displaying pieces that are of high quality and beauty, while keeping those lower quality, smaller pieces in safe storage. I say this because you likely don’t have room to show off every piece, so you might have to pick and choose. Replicas make great display pieces due to their nice finish and completeness. When displaying your fossils, do so in a safe way. You don’t have to necessarily keep them behind bulletproof glass, but keeping them out of reach of children or pets isn’t a bad idea. Remember these aren’t toys, but rather pieces of history and art. A shelf a few feet off the ground makes for a good display area, so long as the fossils aren’t teetering on the edge. If their aren’t any young children or rambunctious pets in your house, then a tabletop or desk is fine too, just keep an eye on them. If you must store any of your fossils, do so safely. Try to keep them in boxes with padding or something similar. Then, I’d recommend storing these safely in drawers. Fossils and fossil replicas hold up well overall, but make sure you try not to store them in overly hot or humid locations. My own personal collection consists of some sixty plus fossils ranging from seashells to dinosaurs, along with over a dozen replicas. It’s taken me over ten years to work on it and it’s still growing. All the pictures seen here are of my own fossils and replicas. Make sure you take your time when collecting fossils. Try to find pieces that are really unique. Above all else, have fun with it. Fossil collecting is a very fun and educational experience. It’s something everyone can get into. As long as you keep digging, you might be surprised at what you might be able to add to your collection. At I Know Dino, we welcome anyone with a passion for dinosaurs. In keeping with that spirit, we’ve asked Taylor McCoy, founder of the website Everything Dinosaurs to share some of his thoughts on dinosaurs. Taylor also kindly gave us an interview for the I Know Dino podcast (Juratyrant – Episode 8). You can find the episode here. My name is Taylor McCoy. Though I’m not a professional, I’ve been personally studying dinosaurs and paleontology for years. In that time I’ve come up with a number of theories and ideas of my own. Many of my theories revolve around large theropods, especially Tyrannosaurus rex. I’ve also visited the Carnegie Museum of Natural History in Pittsburgh a number of times. My personal fossil collection numbers over 40 fossils and a few replica fossils. My specimens include dinosaur fossils, trilobites, fish, shark teeth (including Megalodon teeth), and many others. Some of these I have purchased, others I found. Many of the ones I found was by simply by keeping an eye out for the right thing in the right place. On a hike in central Pennsylvania once for example, I spotted a small trilobite. While on vacation in New Jersey, I found the lower jaw to a prehistoric angler-fish relative called a goosefish. As with nearly every dinosaur lover, I’m quite excited to see Jurassic World when it comes out. I’ve been following the film’s development for a few years now and the news on it just keeps getting better and better in my opinion. In June of 2013, I decided to make a website in order to get my knowledge out there to share with the public called Everything Dinosaurs. Since it’s creation, my site has received over 30,000 visitors. A comment and question box, along with a “Favorite Dinosaur” poll is also featured on the home page. Dozens of people have also used these features. The most common entry in the poll so far is Tyrannosaurus. While many “dinosaur sites” feature animals that lived before and after dinosaurs like Megalodon, the Wooly Mammoth, and Dimetrodon, Everything Dinosaurs focuses entirely on dinosaurs and their contemporaries. In fact, the most recent addition (the 151th featured species) was a dinosaur contemporary called Desmatosuchus. Some of the information on the site will be similar to that of other sites and sources whenever it’s information I agree with. However, it’s clear that my personal theories and opinions have worked their way into much of it. Good examples of this can be seen on the Tyrannosaurus and Spinosaurus pages. I don’t really have a specific strategy when choosing new additions to the site. I’ll often be influenced by new discoveries, suggestions, or simply thinking of one I hadn’t added yet. Once I choose a new species to add, I’ll start doing some “refresher research” to try and make sure the page is as accurate as possible. This information is added to my previous knowledge and incorporated into the page. I’ll then go and find a good picture and size comparison to use for it. If there isn’t a good picture or size comparison, I may not add the animal, as those are very important in my opinion. Probably the most frequently visited page on the site, besides the home page of course, is the T-rex page. The reason for this is probably simply because T-rex is the most famous dinosaur. That said, my site has allowed many to learn about lesser known species like Alamosaurus and Ceratosaurus as well. I think everyone that wants to have their voice heard when it comes to paleontology should make a site (a legit one, not some troll site). It’s fast, easy, and in many cases, free. It’s also fun and very satisfying. Getting to see so many people enjoying my site and getting information from it is great. In my opinion, it’s important not to follow the crowd. It’s good to read what others think and take it into account. However, it’s important to draw your own conclusions and the like. Making a site is a good way to do that. A link for the site can be found at the bottom of the post, along with a link for Weebly, the site I used for making Everything Dinosaurs.